Panthers fans have been urged not to heap pressure on hot property Robert Lambert. The sought-after teenager has launched his debut Premier League campaign in stunning style with four successive double-figure scores. It is a fine return from a rider who only celebrated his 17th birthday on Easter Sunday. The following day he played a starring role in the two triumphs which ignited the city club’s season. Lambert teamed up with Michael Palm Toft for a nerveless 5-1 in a final-heat decider to secure a 47-43 success at Rye House and he then top-scored with 13 points as Ipswich were blown away 56-37 at the East of England Showground. But team boss Carl Johnson stressed: “We were confident Robert would do well, but I must admit I’m pleasantly surprised by how quickly he has settled into the Premier League. “He is well suited to the Showground after growing up on the big, fast tracks in Germany, but he has a lot of new away tracks to learn and I was really impressed with what he produced at Rye House. Johnson has also been hugely encouraged by the recent displays of Palm Toft. 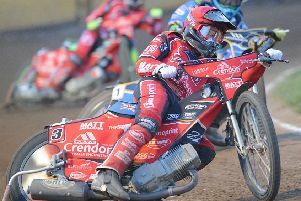 The Danish ace, drafted in on a short-term deal following the opening day of the season smash that left Adam Roynon nursing broken ribs and a punctured lung, has been hugely impressively of late. Palm Toft has been paid for 34 points in the past three meetings – form which could prompt bosses to attempt to hang onto him for longer. Johnson added: “Michael was fantastic over Easter and it is great to see him riding like that. His form could give us a headache but I would much rather have a problem due to a rider going well than one struggling. Palm Toft could be a trump card tomorrow night when Panthers make the long trek to Plymouth for the first of two Southern Group meetings in three days against the Devils. The 24 year-old had a short spell with the Devon club in 2013 and is known to like the small St Boniface Arena track where the action gets underway at 7.15pm. Panthers have also drafted in the rider who finished last season as their number one to guest tomorrow night. Lasse Bjerre, now of Redcar, steps in for injury victim Olly Allen. GB rider Danny King is booked for the return clash at the Showground on Sunday (3pm) after starring against Panthers for Ipswich over Easter. Plymouth are spearheaded by American ace Ryan Fisher who rode for Panthers in 2013 and for the opening half of last season until being sidelined by a shoulder injury.